Understanding the molecular evolution of vertebrate eye or at least its components (e.g. retina or lens) is thus highly warranted. In our lab we are trying to add some bits and pieces to the topic of evolution of vertebrate eye. I am currently working on my PhD. thesis at the Department of Transcriptional Regulation, Institute of Molecular Genetics of the Academy of Sciences of the Czech Republic in Prague. My supervisor is Dr. Zbynek Kozmik, who has a broad history in the field of developmental biology of mouse eye, as well as in the field of the evolutionary developmental biology (evo-devo) on various animal models with about 65 original research papers published. The main topic of our lab is understanding the development of visual apparatus in various animals (both vertebrates (mouse and fish) and invertebrates (amphioxus Branchiostoma floridae & Branchiostoma lanceolatum, jellyfish Tripedalia cystophora and marine annelid Platynereis dumerilii) and its implications for the evolution of eyes and vision in general. My research interest is studying the development of simple visual organ of two species of amphioxus, Branchiostoma floridae (from the western coast of Florida) and Branchiostoma lanceolatum (from southern Mediterranean French coast). Amphioxus belongs to the Subphylum Cephalochordata, the most basal group belonging to chordate phylum (Fig. 1). Amphioxus has a simple body plan exhibiting most of the features of early chordates and probably a vertebrate ancestor (e.g. notochord, dorsal nerve cord, pharyngeal gill slits). 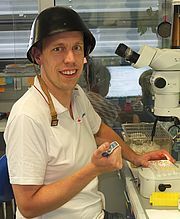 Its simple body plan together with its simple genome organisation place amphioxus in unique position for exploration of the evolution of vertebrate traits (Holland et al., 2008). Figure 1: Simplified phylogenetic tree documenting the position of amphioxus (from Lamb et al., 2007) - Amphioxus (or Lancelet) belongs to subphylum Cephalochordata, the most basal chordate phylum. Amphioxus possesses four morphologically different visual apparatuses (Lacalli, 2004) (Fig. 2). One of these visual organs, the so called frontal eye, is located in the anterior tip of the neural tube and consists of about 10 photoreceptor and about 5 adjacent pigment cells. Based on the morphology of the photoreceptor cells and the position in the anterior of the neural tube, the frontal eye, even though being unpaired, has always been considered as a possible homologue of vertebrate paired eyes. Figure 2 Amphioxus photoreceptive organs (from Lacalli, 2004) - Amphioxus posses four different photoreceptive organs. The so called „frontal eye“ was considered as a possible vertebrate eye homologue, mainly because it is composed of ciliary photoreceptors and is located on the anterior tip of neural tube. Other amphioxus photoreceptive organs are probably homologues of other photoreceptive organs in vertebrates – lamellar body (consisting of ciliary photoreceptors) is probable homologue of pineal gland, while Joseph cells and dorsal ocelli (or sometimes called Hesse cells), both formed by rhabdomeric photoreceptors, are considered as a possible homologues of vertebrate intrinsic photoreceptive Retinal Ganglion Cells (Koyanagi et al., 2005). To determine, if the morphological homology between amphioxus frontal eye and vertebrate eyes is relevant even on gene expression level (i.e. shares comparable molecular fingerprint with vertebrate eyes), we apply whole mount immunofluorescence staining of amphioxus larvae. For staining we use “homemade” antibodies raised against amphioxus homologues of genes, involved in the development (transcription factors, e.g. 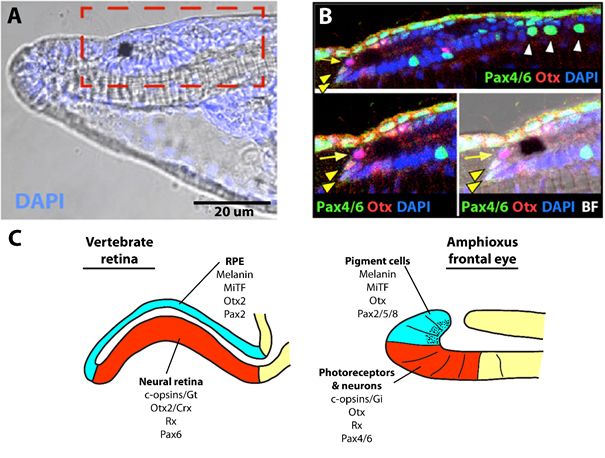 Pax6, Rx or Otx), phototransduction cascade (c-opsins or Gi alpha subunit of trimeric G proteins) and pigmentation of vertebrate eyes (transcription factor MiTF). We scan stained larvae using confocal microscope that allowed us gaining single cell resolution. Our results showed, that the molecular fingerprint of amphioxus photoreceptors and pigment cells, resembles the molecular fingerprint of vertebrate photoreceptors and retinal pigmented epithelium (Vopalensky et al., 2012) (Fig. 3). Figure 3 Comparison of molecular fingerprint of amphioxus frontal eye and vertebrate eye A – Detail of anterior part of Branchiostoma floridae 48 hours old larvae. Dashed rectangle marks area of so called cerebral vesicle – most anterior part of Amphioxus neural tube, with the frontal eye (pigment cells visible). | B – Example of data obtained by whole mount imunofluorescent staining, here expression of transcription factors Otx and Pax4/6 in B. floridae frontal eye. Otx is expressed in pigment cells (yellow arrow) and photoreceptors (yellow arrowheads). Pax4/6 is expressed in photoreceptors (yellow arrowheads) and so called Primary motor center (white arrowheads), possible light signals processing center. | C – Schematic comparison of molecular fingerprint of developing vertebrate eye and amphioxus frontal eye. Molecular fingerprint of Amphioxus pigment cells and photoreceptors resemble the molecular fingerprint of vertebrate retinal pitment epithelium or vertebrate neural retina, respectivelly. Recently, we continue with studying the formation of amphioxus frontal eye from neurula to larval stage. We would like to understand forming of amphioxus photoreceptors from broad areas of neural tissue. We also decided to add to our studies evoltuionarily distant Cephalochordate Asymmetron lucayanum, possible splitting from B. floridae and B. lanceolatum about 120 million years ago (Yue et al., 2014). Adding Asymmetron in our analysis can help us with getting insight into the basic principles of chordate photoreceptors and pigment cells development. 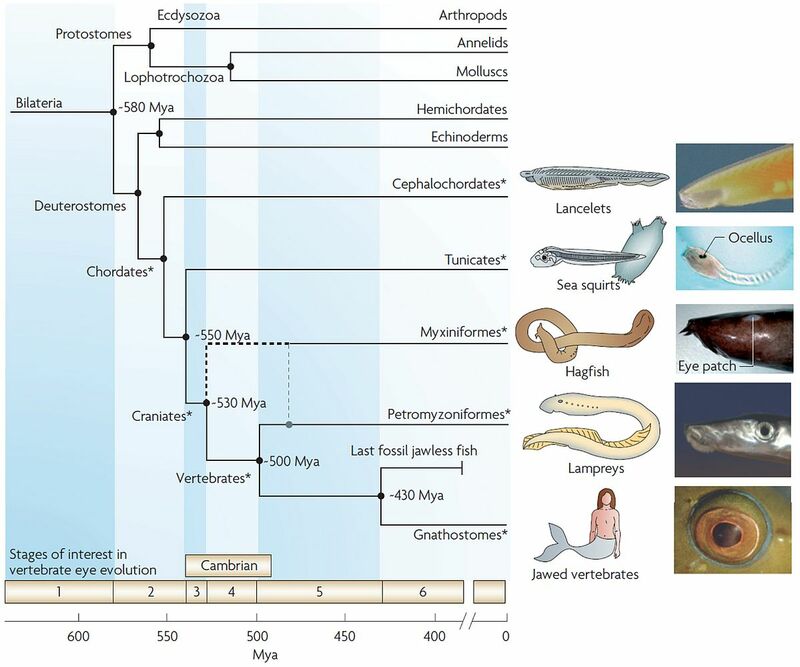 Holland LZ et al., The amphioxus genome illuminates vertebrate origins and cephalochordate biology (2008), Genome Res., 18(7):1100-11. doi: 10.1101/gr.073676.107. Koyanagi M, Kubokawa K, Tsukamoto H, Shichida Y, Terakita A, Cephalochordate melanopsin: evolutionary linkage between invertebrate visual cells and vertebrate photosensitive retinal ganglion cells (2005), Curr Biol. Jun 7;15(11):1065-9. Lacalli TC, Sensory systems in amphioxus: a window on the ancestral chordate condition (2004), Brain Behav Evol., 64(3):148-62. Lamb TD, Collin SP, Pugh EN Jr., Evolution of the vertebrate eye: opsins, photoreceptors, retina and eye cup (2007), Nat Rev Neurosci. Dec;8(12):960-76. 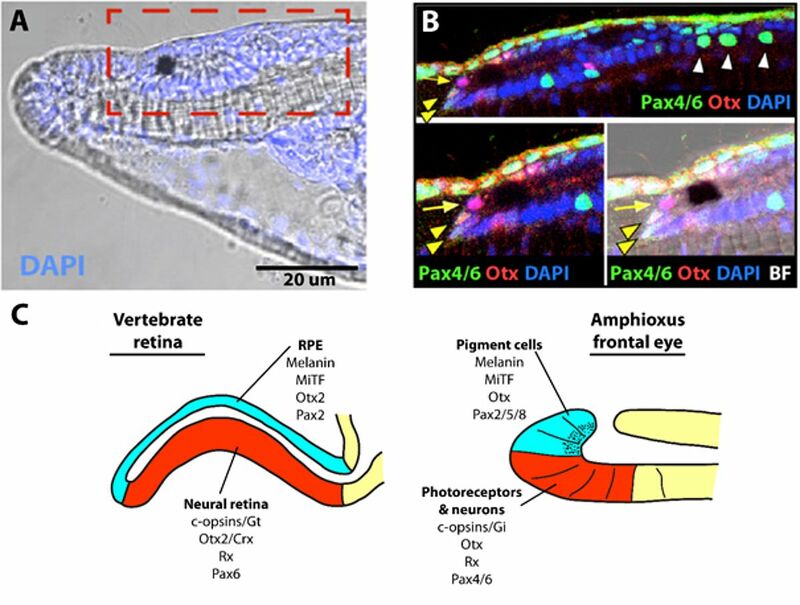 Vopalensky P, Pergner J, Liegertova M, Benito-Gutierrez E, Arendt D, Kozmik Z, Molecular analysis of the amphioxus frontal eye unravels the evolutionary origin of the retina and pigment cells of the vertebrate eye (2012), Proc Natl Acad Sci U S A., 109(38):15383-8.